Wouldn't it be great if somebody built a compact, automatic valve tester that could check all the common 'muso' valves without the operator needing a degree in electronics? Despite being a supposedly obsolete technology, it seems that in the audio industry at least, valves or 'tubes' refuse to lay down and die. They're found in certain models of microphone, in both all-valve and hybrid outboard gear, in preamps, in all manner of guitar amplifiers and even, on occasion, in mixing consoles, not to mention a handful of synths. Traditional valve testers are cumbersome things covered in knobs and meters — and they also require a fair amount of skill to operate. Wouldn't it be great if somebody built a compact, automatic valve tester that could check all the common 'muso' valves without the operator needing a degree in electronics? 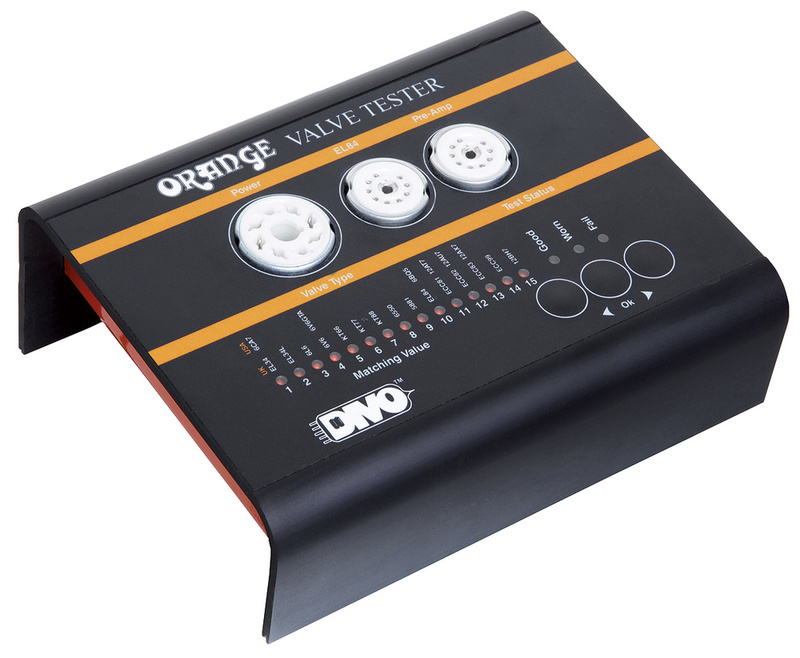 That's exactly what Orange have done, and though their DIVO VT1000 valve tester looks disarmingly simple, its internal DSP controller circuitry tests the valve using a wide range of parameter checks and then presents you with a numerical 'matching' value if it passes. This helps you match valves for use in push-pull output stages, although you should always use the same brand of valve to make up the pair. In the case of preamp valves, it shows how closely the two halves are matched and also gives an indication of how much gain they have. The tester is small enough for guitar techs to take on tour, and is certainly appealing to guitar stores, but if you have a lot of valve gear in your studio, you might feel it worthwhile to get one of your own. The VT1000 has one octal and two nine-pin valve sockets on top to accept different valve types, the centre socket being for testing EL84 power valves and the other nine-pin socket for testing preamp valves such as ECC83s (12AX7s). Power comes from an external adaptor and the voltage is multiplied inside the tester to produce the high test voltages that are required. All the operator has to do is put the test valve into the right socket, select the valve type from the list printed on the unit and then press OK to initiate the test, after which the DSP takes care of everything else. The results are displayed via LEDs, with a simple Good, Worn or Fail categorisation, along with a Matching value, and the job is done. Despite the simplicity in use, the testing process is quite rigorous. After checking for simple things such as open or short circuits in the heaters, the VT1000 also checks for internal leakage and confirms that the correct currents are being drawn by the heaters, grids and anode. Voltage and power gain are checked, there's a gas ionisation test and, in the case of dual triodes, both halves of the valve are checked in one test pass. There's also a test for 'flashover' where 380V are applied via a current-limiting circuit, so that failures don't result in a pyrotechnical display. A matching number is then generated for those valves that pass all the tests, with a higher matching number usually equating to more gain. This number is calculated by combining the test results and depends on the valve's typical function. Power valves are graded mainly on their emission and control grid performance, whereas preamp valves take into account parameters relevant to their roles in signal amplification and phase-splitting applications. Where the two halves of a dual triode are not equally matched, two matching LEDs will light to show how closely the two halves match up — or not! If the difference is more than six, the valve will be failed. Usefully, this device also has built-in protection against faulty or wrong valve types being inserted, so if you do make a mistake you'll just see a fail light, not an explosion! Note, though, that testing a hot valve pulled directly from a working amplifier may result in a failure, as the tester is calibrated to heat the valve up as part of the test sequence. If you're worried about wearing out the sockets by continued use in a commercial situation, you can also buy socket savers, which are inexpensive secondary sockets that plug directly into the primary ones of the tester itself. That's the theory, but how is it to use in practice? I plugged in the first ECC83 I could lay my hands on, pressed the OK button, used the up/down button to select the LED opposite the ECC83 panel legend and pressed OK again, and the test was under way. It was completed in just under a minute. During this time, the Matching Value LEDs gradually extinguished and deemed the valve good, with the number seven matching value LED on and the number eight LED flashing, which I took to read 7.5ish. Another much older 12AX7 was subjected to the test and came back as working but worn — fair enough. (I did eventually read the manual to make sure I hadn't missed anything!) I repeated the process for a number of other preamp and power valves that I knew to be new or much-used. It was worth doing, too, as some of those I'd assumed would be worn scored pretty well. There are, of course, limitations to any valve testing process. For example, the test won't tell you which is the quietest valve for use in the first stage of a preamp or valve microphone (you have to determine that by trial and error). The same goes from microphonic valves. While the list of supported valve types is long, some of the more obscure valve types are inevitably not supported. There's also no provision to test valve rectifiers such as the GZ34, although if one of those fails it's pretty easy to determine the fact in situ! Realistically, though, this tester will cater for most modern guitar amp valve types, and many of those, including the ubiquitous ECC83/12AX7s, which find their way into all kinds of studio gear. I have to say that the DIVO VT1000 is a brilliantly designed piece of kit that makes valve testing both fast and simple — so much so that its manual is almost redundant. It's a no-brainer for guitar stores, but will also be useful in studios, enabling you not only check your own valve gear, but also to charge your clients a nominal fee to have their guitar amp valves checked when they turn up for a session!